Denise Gimpel’s treatise on Republican-era writer Chen Hengzhe (陳衡哲, 1890—1976) is a welcome addition to English language works on influential female authors from China. Her study situates Chen at the crossroads of “orthodoxies,” or cultural scripts that define the individual and her milieu in specific historical contexts. Gimpel views Chen as an example of a “typical intellectual” of her time who played an important role in recasting the epistemological structure of knowledge—the embedded narratives that defined Chinese and Western cultures—as China was transitioning to a modern nation. For Gimpel, Chen was someone who sat in-between global forces of the time, “never a real academic, real writer . . . neither really active educator nor really happy housewife and mother” (13), someone who used the transitional spaces between these orthodoxies to transform the organization of knowledge systems. As a result, Gimpel challenges readers to reconsider gender-encoded assumptions (both then and now) underlying both the well-trod historical moment of China’s formation into a modern nation and intellectuals’ contributions to that process. Chen Hengzhe is mostly known by Occidental sinologists as the first female professor of Western history in China (at Peking University); among Chinese sinologists, she is known as one of China’s first female authors to write in the vernacular, as a rumored paramour of Hu Shi, and as part of the first wave of Chinese students to study overseas on the Boxer Indemnity scholarship. What is little known about this author on both sides of the Pacific is the creative role she played as cultural ambassador between China and the US, translating cultural knowledge so that each had a better understanding of the other. 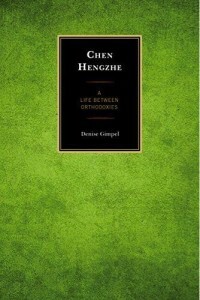 After an introduction to her conceptualization of the transformation of orthodoxies (in which she addresses a number of theoretical approaches and concepts), Gimpel then devotes a chapter each to: an overview of Chen’s life and scholarly output; a close examination of her fictional works as a way to unpack Chen’s perspective on humanity; and Chen’s role as cultural translator for both Chinese and US audiences. Gimpel concludes her study with a discussion of Chen’s autobiography and its role in self-authorship. The Introduction explains how Chen Hengzhe and her intellectual contemporaries were agents of change, utilizing their social positions, authority, national and international connections to harness cross-cultural encounters and the resultant frictions as “transformative spaces” (5). Drawing from the work of cultural geographer Doreen Massey, Gimpel argues that these spaces possessed creative and productive value, even if they did not have political weight. For Gimpel, the political value of cultural translation is secondary to intellectuals’ roles as “bridge builders” who neither chose nor questioned the location of their cultural crossing. “[The bridge] was forced upon them by historical circumstance,” Gimpel writes, “and their own desire for a new start for themselves and China” (9). To that end, Gimpel suggests that the book focuses on Chen Hengzhe as a figure who introduced China to a “global knowledge” system that was to transform the way China perceived itself. Chapter 1, “A Life and Its Spaces,” examines Chen Hengzhe’s life with a “relatively objective outline” (18) to gauge what it was that led intellectuals of her generation to see themselves as “bridge builders,” from whence they drew their cultural authority. Gimpel observes that though Chen built bridges to the new social and cultural spaces that were increasing women’s mobility, and used narratives of her own life and fictional works as models, she in many ways “failed to make use of them” herself (11). Gimpel picks up clues from Chen’s formative years, education, and early writings about her belief in self-authorship and the creation of one’s own destiny (造命). Chen was one of ten women among some one hundred men chosen to study in the United States on a Boxer Indemnity scholarship; she began at Vassar College and later earned a masters in history at the University of Chicago. She was an active contributor to overseas Chinese student magazines and journals as well as a participant in the Science Society (科学社). She returned to China to take up a post in the history department as Beijing University’s first female professor. Here she and like-minded returned overseas students sought to teach the scientific method of learning to their students. Yet shortly after taking up the position, Chen quit, both out of disappointment in her students and because she was pregnant. She lived a peripatetic life thereafter, following her scientist husband, Ren Hongjun (任鴻雋), from post to post. In between subsequent teaching posts and pregnancies, Chen produced history books on the West and on the European Renaissance, as well as essays and other literary works. Chen also represented China at the Institute of Pacific Relations. Her textbook on the history of the West was a best seller, and she was able to play a prominent intellectual role through her writings and editorship of literary journals. Yet, Gimpel argues, “in many cases her own nature and the nature of her ambitions appear to have been at odds and thus thwarted the places and spaces of opportunity that were available to her” (33). Gimpel conceives of these places and spaces broadly to include the material as well as the ideological, such as schools, newspapers, research institutions, as well as Chen’s narratives of strong and talented women, her questioning of womanhood and manhood categories, her theories of modern and traditional pedagogy, and the widespread belief of returned overseas students that they were moral men (君子). In her second chapter, “Fictions of Science, Destiny, and Life’s Choices,” Gimpel characterizes Chen’s fictional writing as non-polemical and universal in character. She finds Chen to have a “charitable understanding of individual human fate in her fictional works” (60), despite impatience with her fellow Chinese. The chapter discusses Chen’s literary output in four sections, addressing: (1) the story “One Day”; (2) fables or allegorical stories; (3) stories of ordinary lives; and (4) essays. Gimpel analyzes “One Day” as an example of the incommensurability between the culture of an overseas Chinese student with the culture of college life in the US, demonstrating that the expectations and realities of intercultural assumptions flow in many directions. She explores how fables and allegories, such as “Little Raindrop,” “West Wind,” and “The Grand Canal and the Yangzi River,” link science to destiny, the individual to the universal. That is, everything adheres to the natural laws of science, which, according to Gimpel, allowed Chen to equate such things as women’s “desire for freedom” with the “West Wind’s appreciation of it” (70). Women’s right to self-determination, Gimpel writes, is echoed in the river’s expression of autonomy. Stories such as “The Grand Canal and the Yangzi River” and “The Cypress and the Wild Rose,” Gimpel offers, take the form of a dialogue that “reflects individuality, lends a directness and immediacy to their messages, and underscores the fact that they depend on human interaction” (73). The family tales in “The Old Couple” illustrates the then-popular conception of companionate marriage and the idea of women’s partnership in the relationship, whereas “Boer” and “Brother Meng” are read as indictments of poverty and the traditional Chinese social structure, which restrict the liberty of their female characters. For the most part, Gimpel reads the stories as articulations of Chen’s advocation of individual choice, whatever the consequences. Yet in order to find the agency in such choices, these stories imply, the social conditions and attitudes surrounding the individual, such as capitalism or patriarchy, must be changed. These social elements are what prevent one’s ability to act in the first place. Chen depicts China as having no “special defect . . . just as there is no special advantage in the West” (88). The modern social issues in China, Gimpel suggests of Chen’s thinking, are the same as those in the West. Similarly, Gimpel summarizes Chen’s non-fiction essays as viewing the good and bad of society with equanimity and thus “finding commonality of human beings the world over” (12). The third chapter, “The Scholar and Cultural Translator,” focuses on the role of Chen’s writing in informing her audience of the world beyond China’s borders. Chen’s two history textbooks aided readers in viewing the world and China’s place in it from a different vantage point, especially via her use of Western terminology and the way she organizes her historical narrative. Chen’s books included illustrations, maps, and tables as a means to make history more accessible to her readership. She used her histories to educate readers about their contemporary condition and to portray war and politics as contrary to culture. In analyzing her history texts, Gimpel foregrounds Chen’s commitment to internationalism, a global outlook, and female agency. At the heart of Chen’s writings, Gimpel demonstrates, is a firm belief in scientific knowledge, the importance of fostering independent thought, and inclusivity. She used a contemporary lens to view history, and thus to link the historical past with present day preoccupations. At the heart of her writings was the desire to democratize knowledge (127), such that historical events are viewed as an extension of natural law, not moral behavior (131). The brief concluding chapter connects Chen Hengzhe’s intellectual work to an extended myth of her own life experiences. Her autobiography ends at the “moment of great promise” and avoids the setbacks and disappointments along her personal and professional career trajectories (149). Gimpel concludes that Chen was a “migrant” who straddled Western and Chinese cultures, on the one hand, and traditional and modern societies, on the other. Gimpel invokes the words of Salman Rushdie, who wrote that the migrant “is not simply transformed by his act; he also transforms his new world” (152). Gimpel’s study of Chen Hengzhe’s life and writings is an important contribution to the scholarship, and it indicates that much room remains for investigation into the lives and works of Republican era intellectuals. Some readers may agree with Gimpel that recent discussions of Chen have been limited in view, focusing solely on her as a feminist, family caregiver, or Hu Shi’s lover. Others may disagree with her implicit assumptions that Chen somehow failed to live up to her potential. I would have liked Gimpel to more clearly draw out the significance of how Chen’s perspective helps us rethink the dominant narratives informing scholars’ understanding of that era. Certainly, it is worthwhile to examine the “gentle revolutionary nature” of Chen’s writings (153) as a means to expand our vision and understanding of the intellectual field in early twentieth century China. As Gimpel notes, “Chen Hengzhe very much saw herself in the role of critic and guide to public policy and attitudes” (102). To this end, it would be worth exploring the life and work of Chen Hengzhe alongside that of her contemporaries such as Bing Xin, whose similar explorations into universal humanity have received equally restricted interpretations, but whose historical and intellectual contributions await notice.